My wife and I are ecstatic about the quality of the replacement part, kept looking to see any difference in the fit and color of the piece. 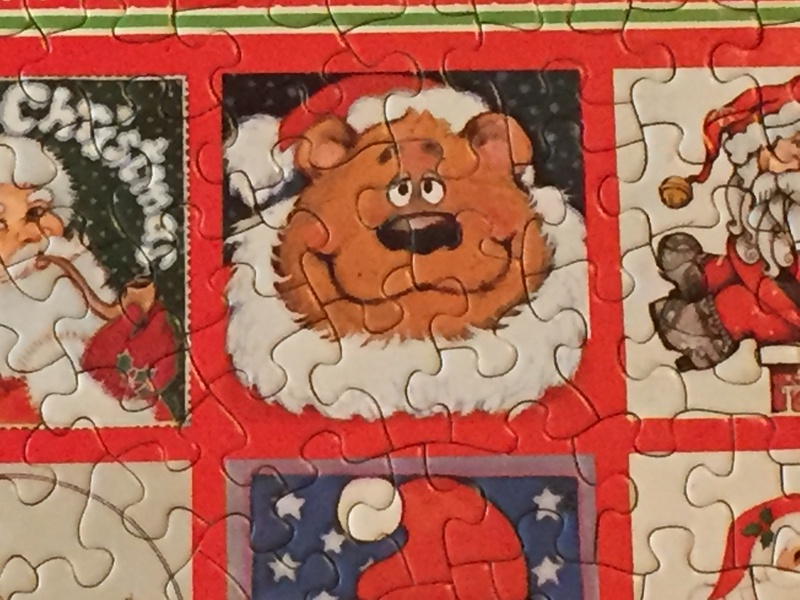 If you’ve got a missing jigsaw puzzle piece, click here to visit the Jigsaw Doctor and find out what you need to do. P D Warren Scaffolding Services are a family run scaffolding company aimed at providing a professional access service to both domestic and commercial clients. Originally based in the Bridgwater area of Somerset they now operate from Wellington, Somerset. Their new premises location allows greater access to the M5 corridor. This enables the company to serve all of Somerset and the surrounding counties of Devon, Dorset, Wiltshire, Gloucestershire and Cornwall. P D Warren have been operating for over 30 years and pride themselves on delivering reliable, safe and affordable scaffolding. Their team is experienced, knowledgeable and friendly. They are available 7 days a week, 24hrs a day if a customer requires an emergency call out. All their scaffolding employees have attended Health & Safety training schemes and have achieved appropriate qualifications to meet high health and safety standards. The core business is the supply and erection of scaffolding. P D Warren Scaffolding Services are large enough to complete large scale commercial projects yet small enough to be flexible. From planning to implementation they are always available to provide advice. They will work directly with their customers to provide efficient and affordable services to help the project run smoothly. P D Warren Scaffolding Services are proud to undertake domestic scaffolding work because they understand that homes are our greatest financial investment. Many types of building work require scaffolding – home extensions, decorating, leaking roofs, loft conversions and the general maintenance of customers’ property. They work with local builders to provide a fast, professional and friendly service. They can design, plan and scaffold any domestic projects. 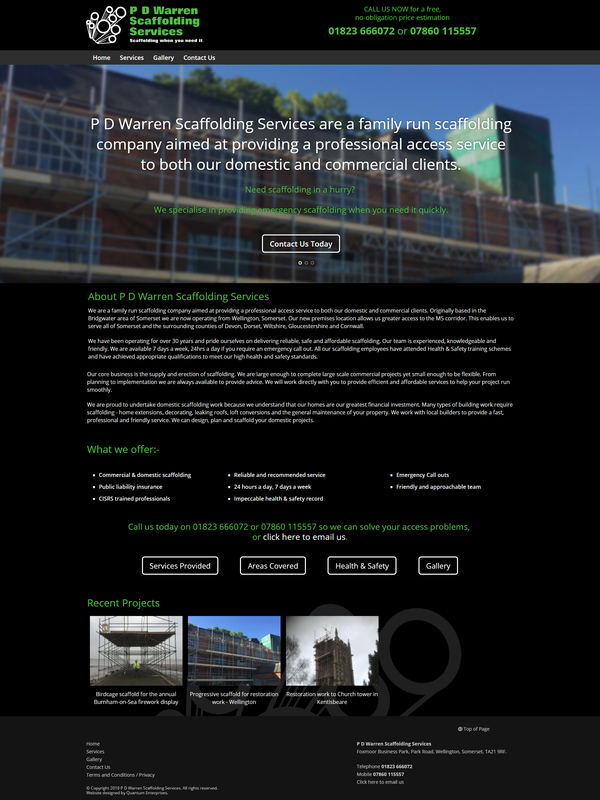 P D Warren Scaffolding Services already had a home-made website built on a ‘do-it-yourself’ platform. Whilst these platforms are great for getting a quick website up and running, the client realised that they cannot beat the attention to detail and flexibility of a professional design service, and thus contacted Quantum Enterprises Web Design for a full website. The website is fully responsive and hand-coded based on the Skeleton Framework. The logo was improved. SEO was conducted to help highlight the client’s main POS: being able to erect scaffolding at short notice. At Quantum Enterprises Web Design we provide cost-effective web design for our clients. On top of that, our clients enjoy comprehensive technical support and a rapid response when a website update is required, all based on over 20 years computing experience. If you would like an update to your own website, especially if it is not yet responsive (mobile friendly), or if you require a new website from scratch, then please contact us at Quantum Enterprises Web Design. We’ve added four more example Premium ‘Ultra’ handwriting fonts to the Scriptalizer software for you to try and buy if you like. You can try the fonts right now in our web-based, Scriptalizer handwriting font software. These fonts have been created using our Premium ‘Ultra’ custom handwriting font service. PremiumUltra35 is a fairly ‘messy’ handwriting font and is almost entirely cursive. The sloppiness is good if you are looking for a very naturalistic handwriting effect. PremiumUltra36 is a nice printed style handwriting font with a simplified style. Another printed style handwriting font with some slant variation giving it a quirky appearance. We think PremiumUltra38 will be a popular font with its traditional, fully cursive style, and slightly messy look. The Premium ‘Ultra’ handwriting font service embeds over 100 additional characters in the font, which are accessed and replaced by our FREE Scriptalizer Software. The software replaces the ‘standard’ characters with alternatives on a semi-random basis. The replacements include individual letters, letter pairs, starting letters, ending letters and starting and ending letter strokes. This adds another level of naturalness to your handwriting font. 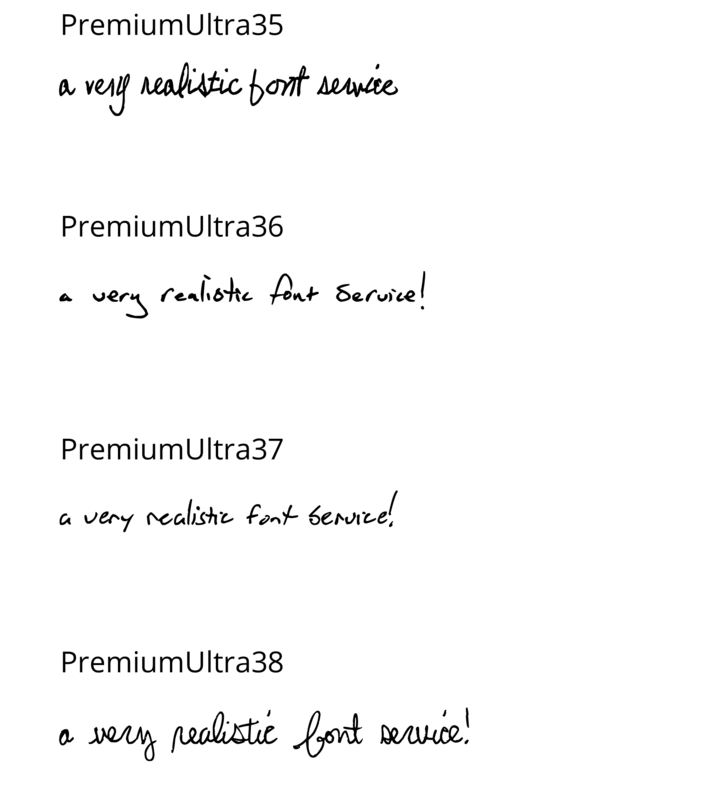 The Premium ‘Ultra’ service is associated with a unique configuration file which encodes certain aspects of your handwriting style. This gives the fonts the most realistic and natural look you could imagine! 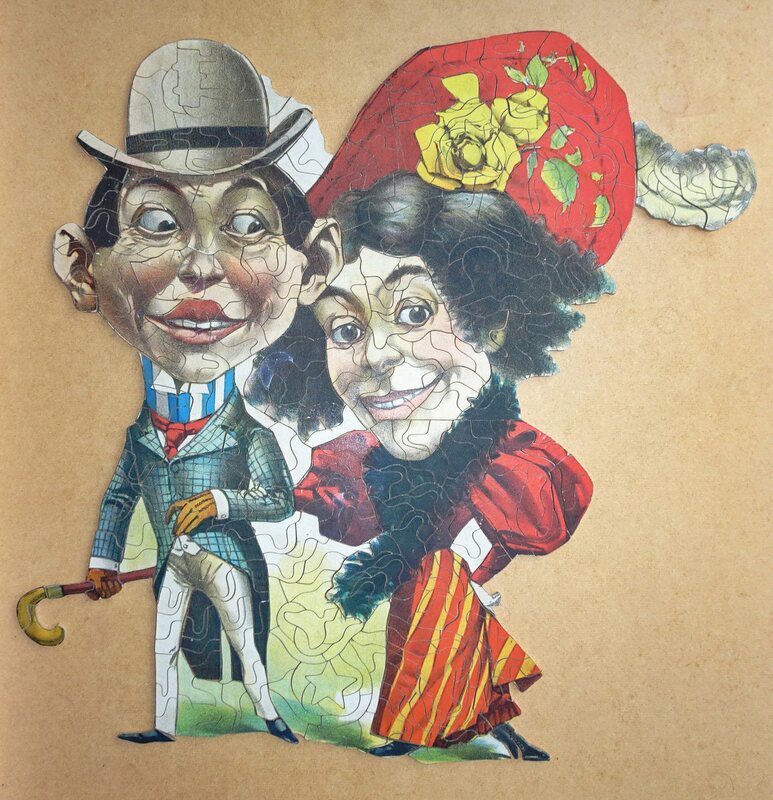 The fonts are of an exceptionally high quality, because the connections of each letter to the next have individually been worked with to produce a truly accurate reproduction of the original handwriting. The Premium ‘Ultra’ Service is required to get the best results for cursive (joined up) handwriting, but also significantly improves the realism of printed handwriting styles. Go to http://www.scriptalizer.co.uk/scriptalizer.aspx to try these fonts or any of the others now for free. Find out how to turn your own handwriting into a Premium ‘Ultra’ font. (You will receive a 25% discount if you allow your font to be made into an example font). Google has announced a deadline of July 2018 (June 30th) as the date for when Chrome will begin explicitly warning users if a site is insecure. Over 50% of Internet browsers worldwide are Chrome, meaning this change will likely have a significant impact on your.website and presence. A prominent warning may affect how secure users feel and may cause some visitors to leave a site, which will negatively impacting a sites bounce rate, visitor engagements, advertising impressions, affiliate clicks and eCommerce sales as well as search engine rankings. People using Chrome as their web browser will see an even more prominent note that the website they’re viewing is not secure. This will cause your website visitors to lose trust in your website and a good percentage of them will leave, thinking the website is either infected or simply not trustworthy. Up to Friday 30th March 2018 at 3pm we will be offering Comodo Wildcard SSL certificates (which are normally £41.95 per year) at a reduced price of only £59.95 for 5 years. This offer will never be repeated. That’s just less than £12 per year (and for 5 years) for securing your site with the latest SSL certification BEFORE the June 30th deadline. This offer can be used to EXTEND an existing SSL certificate further. To order your 5 year SSL certificate please contact us before 3pm on Friday 30th March 2018. Your best bet is to make this switch now. This was something we promoted heavily last year. It used to be just banking or e-commerce websites that needed to do this in the past but now it’s something for every website. Since a secure website is something that improves the user experience, it has been said that Google gives these websites a boost in rankings. That’s not officially confirmed but we do know that people trust these websites more and Google does want to provide results where the user experience is very good. There’s really no reason not to do it. We’ve had some more great feedback about our replacement jigsaw piece service known as The Jigsaw Doctor. Easy and efficient to use website. 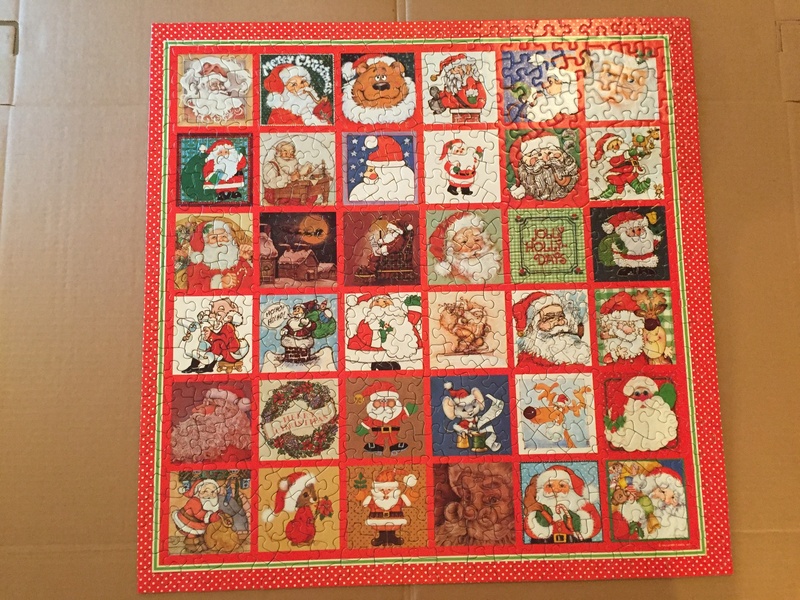 Speed and quality of work on the missing piece is outstanding. 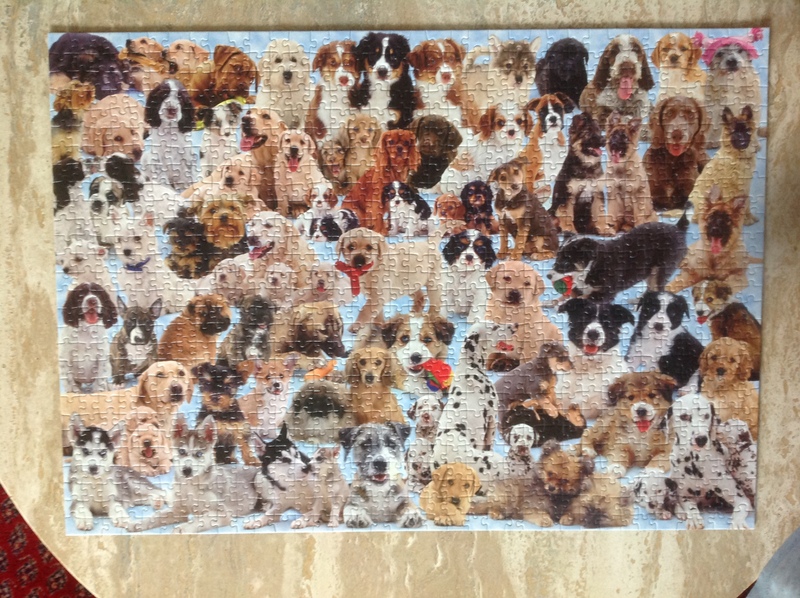 My new puzzle piece arrived today in the post and I am so happy and pleased with it. 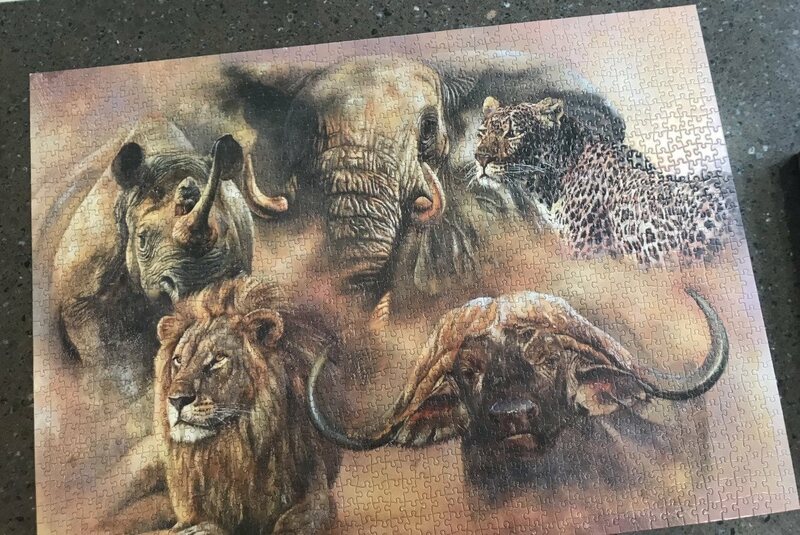 I find it amazing how the Jigsaw Doctors have managed to create such a difficult piece and have it fit perfectly to match the colour and shape of the surrounding puzzle pieces. 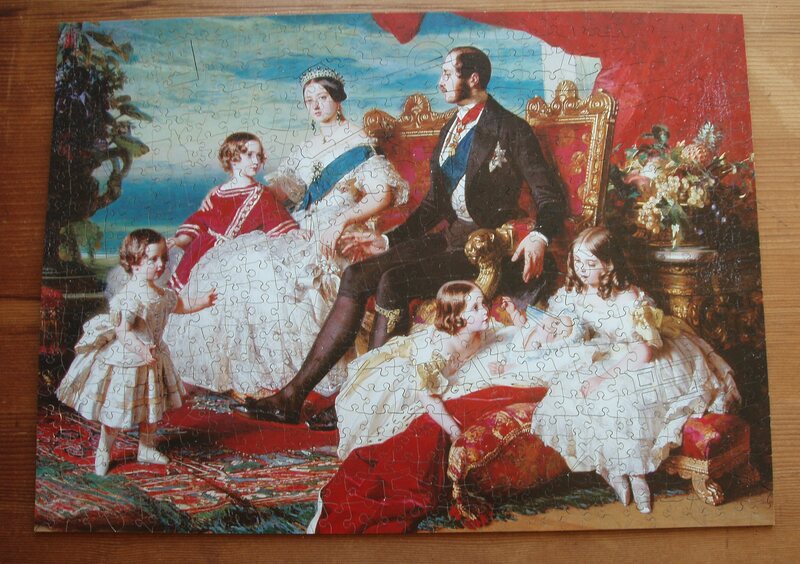 Very happy with The Jigsaw Doctor so thank you very much. I thoroughly recommend this service, they have finally enabled to me get on with gluing my puzzle together and framing it. 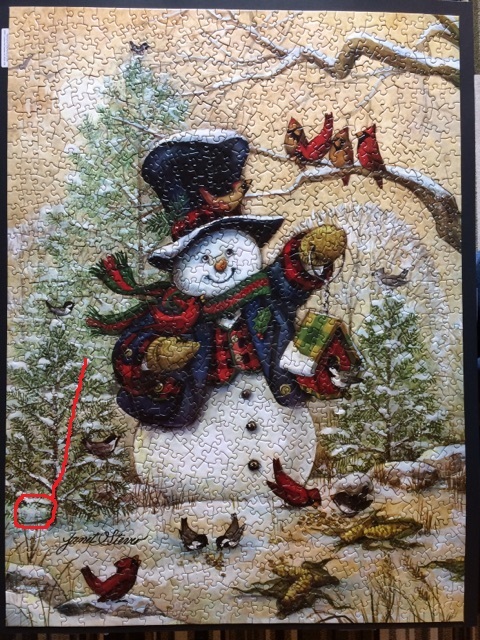 Thank you for creating the 3 missing pieces, very hard to spot. The rather strange jigsaw is now complete! Great job! This puzzle is a wooden one and the pieces match perfectly. 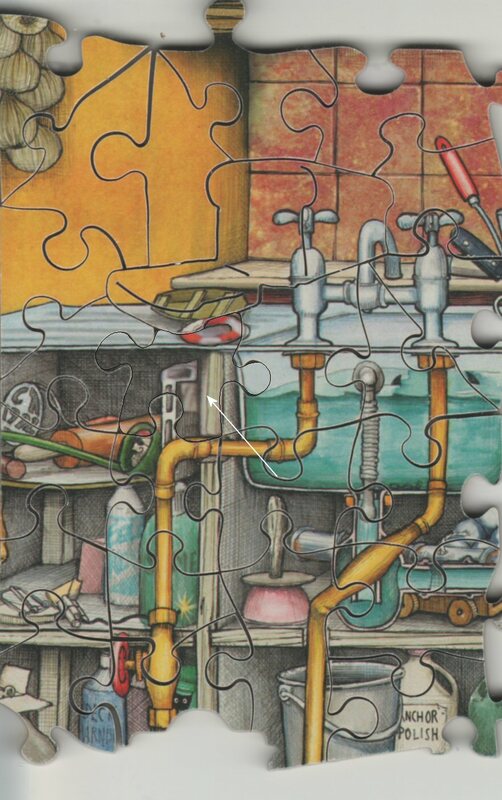 My only thought is that if there are 2 pieces together that are missing Puzzle Doctor makes it one. That is really not an issue for the overall look. Our process does mean that we make two or more adjacent missing jigsaw piece as one larger piece, but as you can see this is not usually an issue for customers, who are pleased just to have that gaping hole filled. 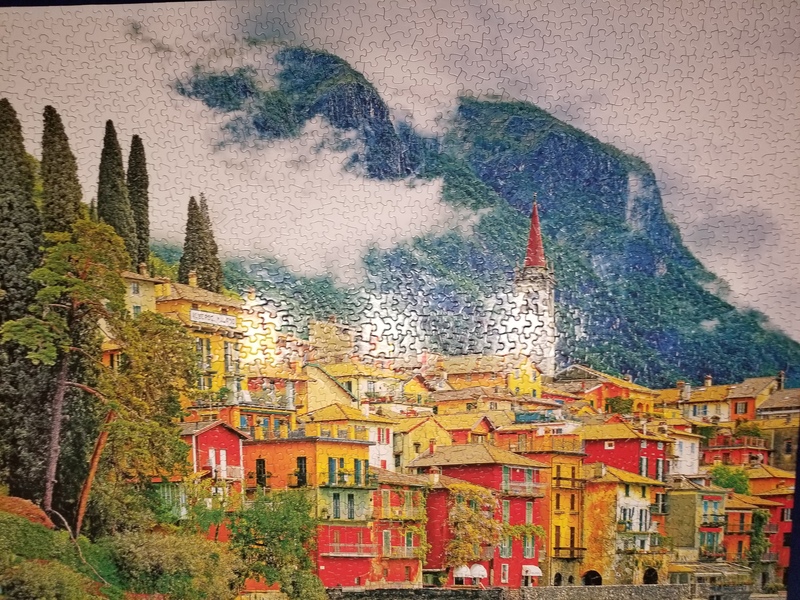 Many thanks for my replacement puzzle piece of which I’m absolutely thrilled, it is such a perfect fit and colour match I found it very hard to find it within the other piece’s. It’s so nice to have my Apple Jack puzzle whole again. 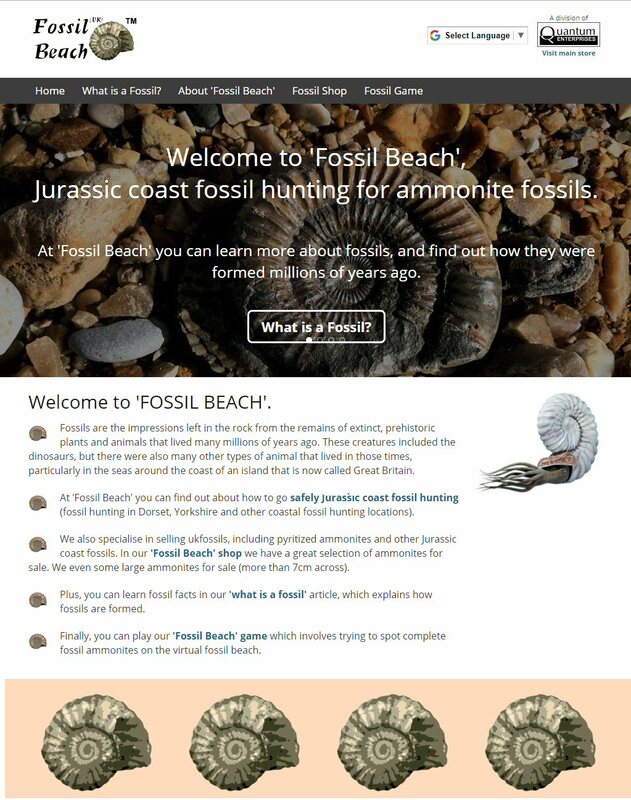 Our ‘Fossil Beach’ website has had a major revamp, making it fully responsive with improved images and an updated and improved fossil hunting game. 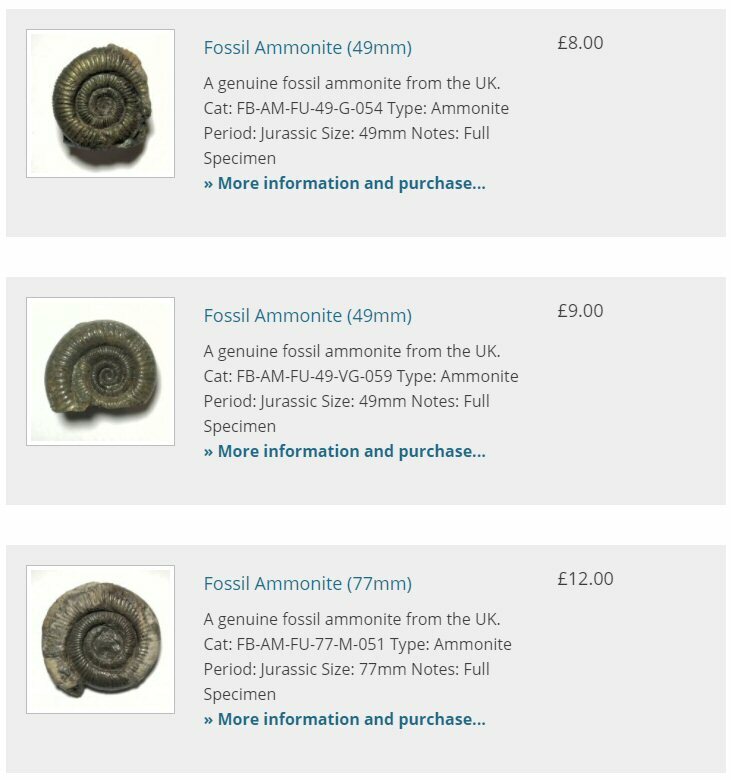 We’ve also re-stocked the fossil shop with quality ammonite fossils, with some large ammonites more than 7 cm across – and at great prices! So, come and join us at ‘Fossil Beach’ to find out more about fossils, how to safely go fossil hunting, purchase quality ammonite fossils, and play the ‘Fossil Beach’ fossil hunting game. At the Jigsaw Doctor we’ve been very busy making replacement jigsaw pieces, and customers have been only too happy to let us know how well we’ve done. I have asked a friend to see if they can ‘spot the repair’. I am pleased to report that they could not. 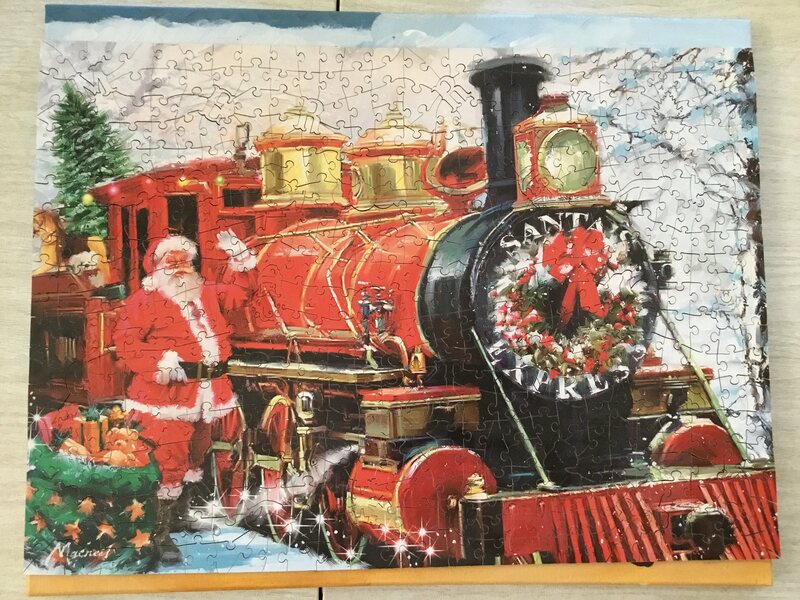 The service provided by the Jigsaw Doctor can be rated ‘excellent overall’ and I will be using the service again as I have other jigsaws with a missing piece. 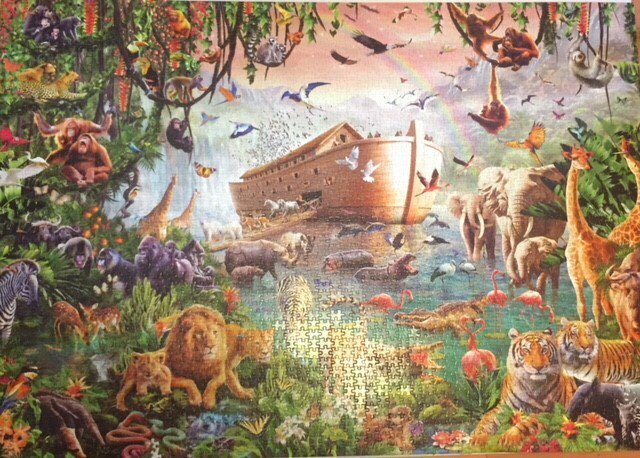 Here’s a photo of his repaired jigsaw. Dear Jigsaw Doctor, The repair piece was perfect. Thanks for a great job. I have already recommended your service to my friends. 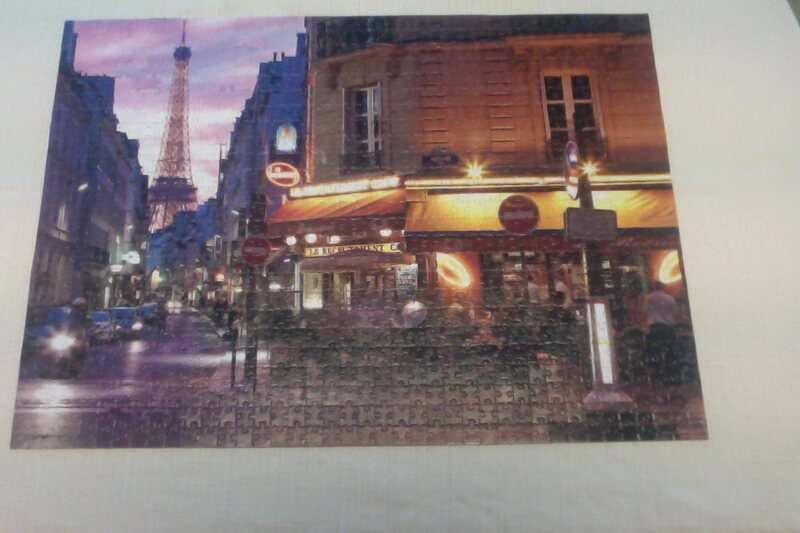 I had few missing peaces and The Jigsaw Doctor send back to me as soon as possible a remarkable piece that fits perfect!!! 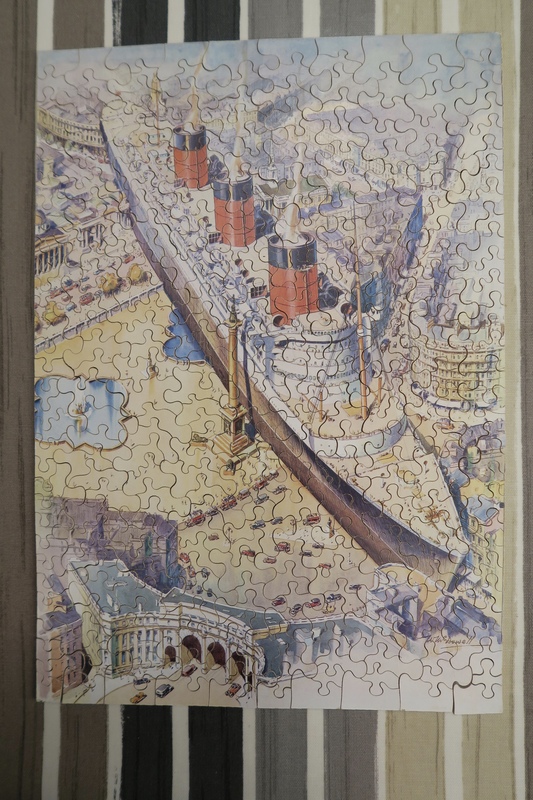 As usual The Jigsaw Doctor provided fantastic quality replacement parts for my vintage wooden jigsaws – great service from a very professional and reliable company. 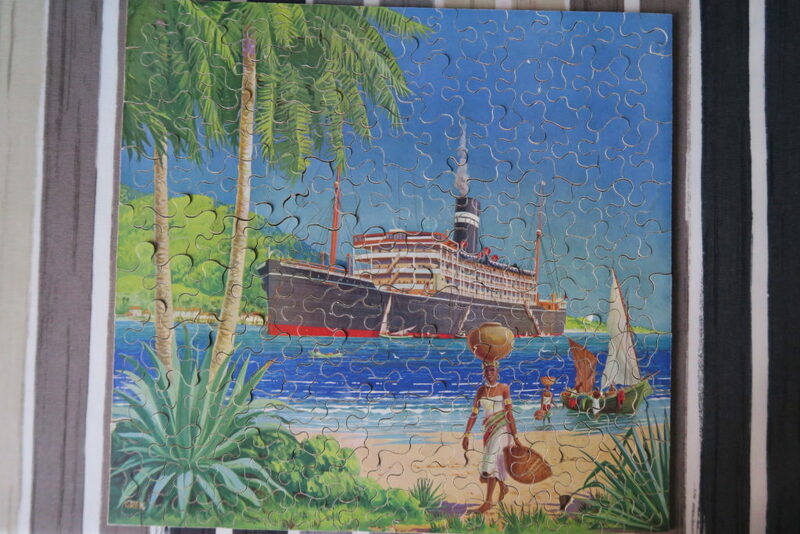 You can see two photos below of the four Chad Valley vintage wooden jigsaws that were repaired (The Queen Mary in Trafalgar Square / The Eastern Way / The Hoover Building / TSS Nevasa in the Kiel Canal). We’ve left it for you to spot the replacements. 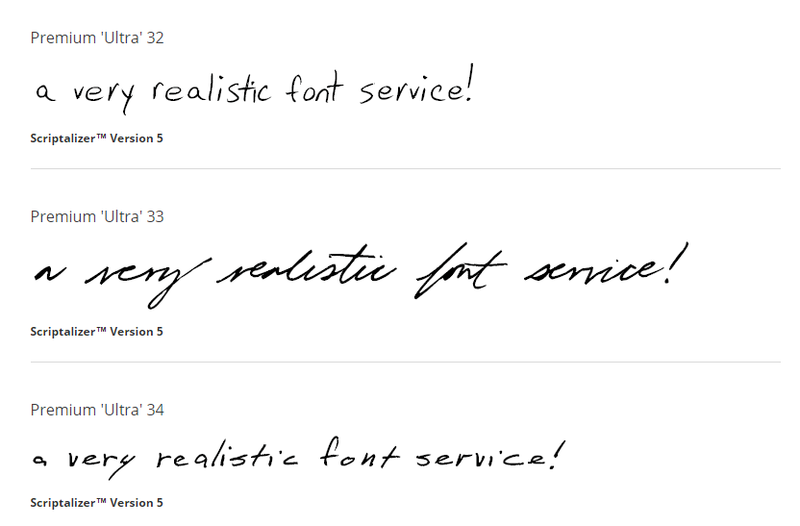 We’ve been busy making super-quality, very realistic handwriting fonts over the last few weeks and we’ve now added three more to the Scriptalizer software for you to try. You can try the fonts right now in our web-based, Scriptalizer handwriting font software. PremiumUltra32 is a lighthearted, printed style font, whilst PremiumUltra33 is a cursive font with a strong rightward slant and some nice flourishes. PremiumUltra34 is another printed font with good letter spacing. I have just received the replacement puzzle piece. Thank You. Fantastic work and great service. I will tell friends who also enjoy puzzling ! 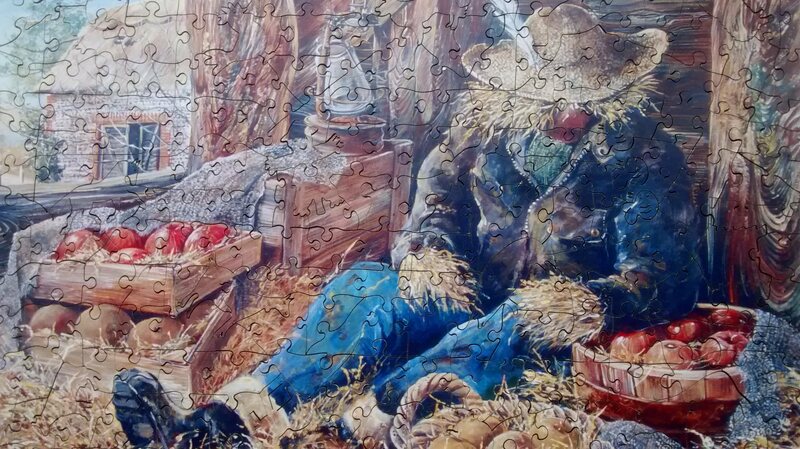 Tim didn’t provide a photo of his finished jigsaw (entitled ‘The Kitchen’), so we’ve included our digital restoration of the image for the missing piece (arrowed).